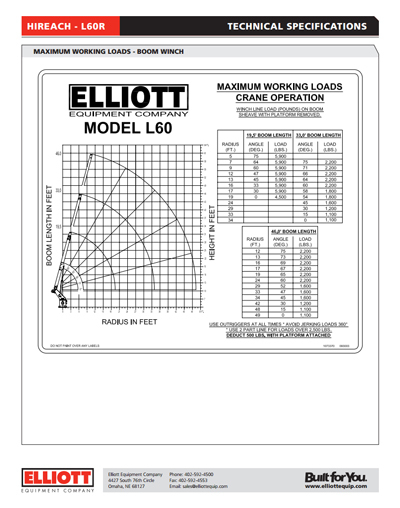 Using the Elliott L60 HiReach technical specification sheet as a reference, there are several charts provided. The first is the Jib Winch chart, which provides a visible diagram of the jib winch and platform capacities. The second is the Boom Winch Chart, which provides the lifting capacities of the optional main boom winch at certain boom angles and radii. For all charts, if work is being performed at a boom length not defined on the load chart, the operator must use the load/capacity rating at the next longest defined boom length on the chart for a given radius. Jib Winch: This chart combines the maximum working load of the jib winch (500 lbs.) with the platform capacity (also 500 lbs.). The total platform capacity is jib load plus personnel. The combination of the weight on the jib winch, as well as the weight of the personnel in the platform must be added together when considering full capacity. The bottom of the chart represents the working radius. The right side of the chart indicates the working height. Capacities are shown within the chart and vary depending on the boom angle. For example, with the boom fully extended at a 60 degree angle, the total platform capacity is 1,000 lbs. With the boom fully extended at a 15 degree angle, the total platform capacity is 500 lbs. Main Boom Winch: The main boom winch chart consists of a range chart and capacity chart. The range chart is an aid for the operator in determining how the HiReach will need to be set up in relation to lifting a particular load. The load radius is shown at the bottom of the diagram. The boom length is shown on the left side of the diagram. The height above ground is shown on the right side of the diagram. Within the diagram, the boom is shown at different lengths and angles. These lengths and angles are then shown on an accompanying chart that provides the different capacities. The capacities listed on the chart are with the platform removed. If the platform is attached, then a 500 lb. deduction has to be considered. For example, with the boom retracted, the capacity of the winch will be 5,900 lbs. at a 33 degree angle and 16 ft. radius. With the boom extended, the capacity of the winch will be 2,200 lbs. at a 69 degree angle and 16 ft. radius. All of these indicators will assist in positioning the HiReach correctly to lift a load.